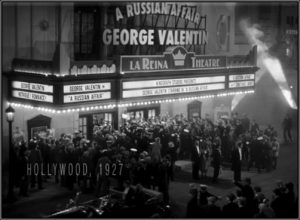 Prominently placed among the films vying for attention this awards season are two films set in the 1920s which convey a similar passion for early cinema, but which take markedly different approaches to bringing it back to the screen. 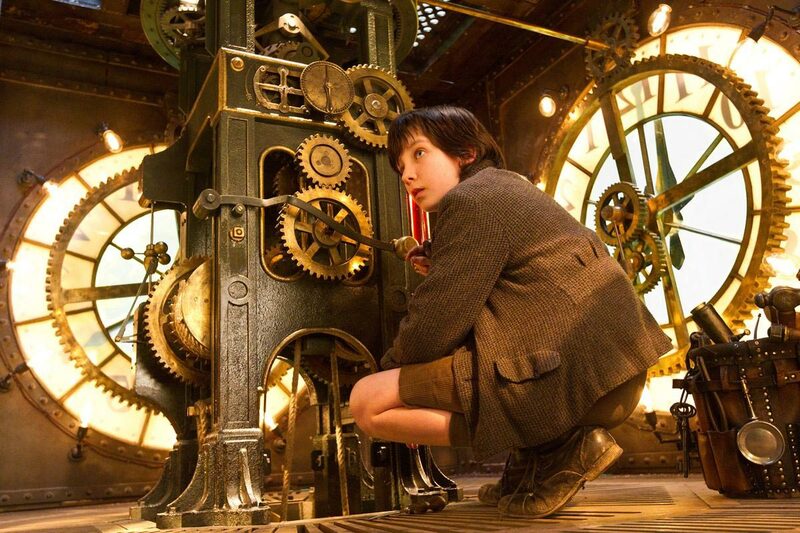 Hugo is a warm-hearted children’s fantasy, and Martin Scorsese’s first film in 3D. The Artist is Michel Hazanavicius’s faithful tribute to the Hollywood silent era, and is itself silent, black and white and presented in the old Academy 1.37:1 ratio. The care which Hazanavicius has taken to produce a film that could credibly have been produced in the late twenties immediately marks The Artist out as different from the rest of today’s standard cinema fare. Whereas many film-makers draw on the past for inspiration, while still attempting to make something in line with contemporary tastes, Hazanavicius seems determined to remain true to the spirit of the twenties, save for a couple of minor (yet effective) departures from the silent form. The direction is largely in keeping with the contemporary style, with plenty of visual invention and a well-judged use of long shots, rather than the medium-close-up, shot-reverse-shot style of directing that has come to characterise today’s less imaginative talking pictures, with their constant mindfulness of television broadcast. No doubt relishing the opportunity to do things the old fashioned way, the production crew have done an admirable job in recreating the look of twenties Hollywood. Cinematographer Guillaume Schiffman sourced old fashioned lenses to soften the picture and capture something of the luminescent quality of twenties cinematography, where actors seem to glow around the edges. Composer Ludovic Bource has composed a playful soundtrack which recalls some of Chaplin’s self-penned scores (save for the perhaps ill-judged inclusion of a track from Herrmann’s Vertigo, which prompted a somewhat hysterical reaction from Kim Novak). And it is all tied together with a wonderfully appealing central performance by star Jean Dujardin as dashing actor George Valentin. Consciously evoking Douglas Fairbanks (even to the point where Fairbanks’ The Mark of Zorro is passed off as one of Valentin’s old films) he has just the right air of studied playfulness, the unashamed hamminess of the character’s performance somehow adding to its charm. The attention to detail makes it clear that the film-makers’ intention is to pay tribute to silent era, rather than to lampoon it as they could so easily have done. This sets it apart from that other great film about the last days of silent cinema, Singin’ in The Rain, which celebrates its sixtieth anniversary this year. Whereas Singin’ in the Rain looked back with irreverence at the hokier aspects of silent cinema and the more inept early talkies, eventually supplanting their archaic form with dazzling Technicolor and stunning musical numbers to illustrate cinema’s progression into something much slicker and more self-aware, The Artist steadfastly stays the course as a silent film, even when the changing world of the story provides opportunities to move on. It invites us to experience the period not as observers from a distant future, but as active participants within the very art form that has come to define this era. Instead of utilising full colour and surround sound to bring the past to life in a manner more akin to the actual reality, it instead allows us to keep hold of our preconceptions of the 1920s as a period that was always silent and monochromatic. After all, that’s the only way most of us have ever experienced it. Hugo takes a quite different approach. It is also set in the 1920s, in an impossibly romantic Parisian train station, but it is shot in colour widescreen and employs the most modern cinema technology currently available: the recently revamped stereoscopic process. Its engagement with the cinema of the past is therefore bound to be quite different, and it almost literally encourages us to look back on the past with rose-tinted spectacles. Almost, in the sense that we are quite literally wearing spectacles, and that much of the film is bathed in gorgeous tones of red and blue which cleverly evoke the two-strip Technicolor that was occasionally employed in the 1920s. It is not a film that is overly concerned with authenticity, and where the 1920s of The Artist is a bustling, urban society not so far removed from the present, Hugo is set in the kind of world which every generation of children likes to imagine has only just passed them by. The train station in which the orphaned, titular character lives and works is a boy’s paradise of private passages and great mazes of cogs and clockworks. There is a hint of steampunk in the story of the automaton, the impossibly intricate mechanical man left behind by Hugo’s father, which attempts to recall a sadly vanishing time, when people were thrilled with the tangible, and the tactile, and the most popular children’s toys were physical thrills like go-carts and building blocks, rather than the illusory and impersonal Nintendo Wii. The tone is one of overwhelming nostalgia, in the true sense of pain for a lost past. Whereas The Artist can almost give the viewer the feeling that their gaze is cutting across time into a still thriving past, Hugo reminds us that even though the films may have survived, the world which gave birth to them is now lost forever. There is perhaps something of an irony lumping the two films together, as though The Artist may make one yearn for a return to the ‘golden era’ of silent film-making, Hugo casts it’s stereoscopic gaze back yet further and puts forth the idea that the early 1900s was the time when cinema was at its most truly exciting. The dilemma is reminiscent of Woody Allen’s Midnight in Paris, released in June, in which the main character’s obsession with 1920s Paris magically allows him to travel back in time to the period. As much as he enjoys chatting with F. Scott Fitzgerald and Luis Bunuel, he is most drawn to an ordinary French girl who, he discovers, harbours a similar passion for the Paris of the 1870s. When the two travel back to that period, the candle-lit romance of the period seems even more romantic than the twenties, and yet its inhabitants express a similar desire to go back to the renaissance. Allen’s central point, that the past was unsatisfying because life is unsatisfying, is a little too cynical to be echoed in a film as idealistic as Hugo. Instead, the main character’s quest to unearth the lost art of early cinema functions to mirror our own yearning for the past, and the films of George Meliere become a metaphor for all that we feel we have lost in cinema, and in life. Though I suspect most people would prefer to sit through a twenties masterpiece such as Safety Last (as Hugo does in the film) than the relatively unsophisticated Voyage to the Moon, it is the latter that emerges here as the more vital and enthralling. Scorsese excels in bringing this world to life, with the 3D beautifully emphasising the theatrically staged action of Meliere’s films, and the tasteful reproductions of hand-tinted colour (though at least some of it is taken from the original film) reminding us that ‘old’ movies aren’t just ‘black and white’ movies. Hugo succeeds brilliantly in re-imagining the past in emotional rather than technical terms, remaining faithful to the spirit of Meliere’s cinema and reminding us of all that is exciting about cinema. Papa George’s insistence on forgetting his past may seem like a plot contrivance earlier in the film, however when it is finally revealed and we see the wonder and invention of those early days of cinema, the pain of loss is made abundantly clear, and the effect is heartbreaking. But, like the heart-rending final scenes of the similarly film-obsessed Cinema Paradiso, Hugo manages to make us pine for the loss of a certain magic in the cinema, and to produce exactly that sense of magic itself. The romantic allure of the past and the overwhelming vividness of the present are fused together in such a way as to obliterate the usually bittersweet taste of nostalgia, and to create a moment free from the doubt and ambiguity which characterises most of our daily lives; a feat that only cinema can truly achieve. When Papa George comments in the final act that life has taught him that happy endings only happen in the movies, we can smile a smile of knowing relief. To paraphrase Allen, one might say that cinema is satisfying because life is unsatisfying. In writing this piece, I find myself being far more effusive about Hugo when, in fact, I’m a little more ambivalent about the respective merits of the two films. On the one hand, Hugo provokes a stronger emotional response, and can claim without reservation to be decidedly its own film, and not simply an exercise in recreating the past. On the other hand, it is a little uneven at times, with the young leads being occasionally cloying, and Sacha Baron Cohen lacking in the comedic nuance necessary to carry off his scenes. The Artist, however, is near flawless in execution, and deserves credit for opening up what I hope will be an ongoing debate about the value of silent cinema in the modern day. It is worth considering exactly how significant the success of a new silent film on mainstream release may encourage a renewed engagement with the form. I suspect that most filmgoers would consider it a pointless anachronism for a film-maker to limit themselves like this in the modern day, and The Artist may not do much to change this attitude, considering that the use of the silent form is justified mostly by its old-fashioned subject matter. I hope, however, that it will serve as a reminder that sound is just one of the many tools a film-maker can play with, along with colour, screen size, and 3D. Whereas past conventions may have been dictated by technological or economic necessity, today’s film-makers have the luxury of picking and choosing as they please, and just as it’s considered quite normal for a film-maker to make a film 2D or black and white when there are ‘better’ technologies available, there’s no reason why film-makers shouldn’t choose simply to make their films silent, or in the academy ratio, if they believe it will enable them to tell their story better. The silence of a silent film need not be simply a lack of sound. There is one full sound scene in The Artist, and its singularity means that, rather than feeling like a return to normality, it serves as an effective intrusion into the world of the main character, providing us with an instantly comprehensible insight into the character’s psychological state. Elsewhere, the lack of dialogue enables us to exercise our imagination, relieving the need for clunky exposition or romantic cliches, and encouraging delightful moments of visual invention, like the scene of Peppy Miller caressing herself with Valentin’s coat, or the moment when Valentin finds himself abandoned by his own shadow. You could of course have moments like this in a sound film, but they wouldn’t always work; the abstracted nature of silent film makes it possible to include visual elements that would seem jarring in the more concrete world of the talkies. Film is at its best when treated as a primarily visual medium, and sound can, sometimes, be an unnecessary distraction (though there is of course no reason why you can’t simply make a sound film without any dialogue). While I don’t expect that The Artist will prompt a renaissance of the silent film, I hope it will at least prove a shot in the arm to the increasingly visually-banal Hollywood output and encourage more people to revisit the films to which it may pay tribute. It’s worth remembering that although it’s hailed as an exceptional film in 2011, it doesn’t seem quite so special when considered alongside the better films of the late 1920s.